At a Bradford County Commissioners meeting held at the Smithfield Township VFW Hall on Oct. 25, commissioner Doug McLinko (center) explained the recent closing of the flight school at the Bradford County Airport. He is flanked by county chief clerk Michelle Shedden (left) and commissioner Daryl Miller. Commissioner Ed Bustin was in Washington D.C. and participated via conference call. 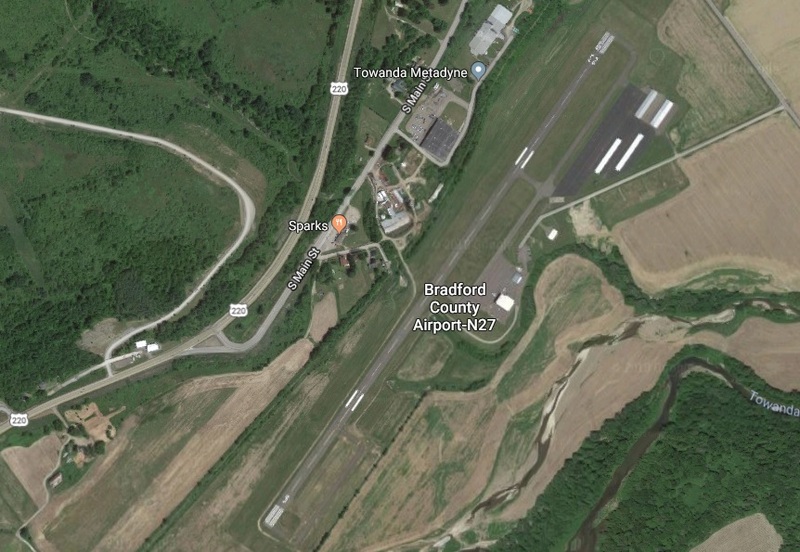 The Bradford County Airport was not built to be a county-owned entity, and there are often times when the county commissioners wish that it was not. County funding ranging from $60,000 to $180,000 per year has gone into its upkeep and necessary upgrades since it was absorbed by the county from Towanda, Wysox and North Towanda townships and the borough of Towanda in the early 1990s. The airport has never turned a profit. Nonetheless, the commissioners announced on Thursday that they are committed to maintaining the facilities as a viable asset to the county, even in the light of the recent closure of a flight school at the airport. While the commissioners contend that they would like to have flight instruction reinstated at the airport in Towanda Township, they do not want to foot the bill. The primary reason for the program’s demise, however, was an insurance snafu. The company supplying instructors was, in fact, a private entity, according to commissioner Doug McLinko. While students paid for airplane rental, the instructors did not. “It can be a very expensive relationship,” McLinko stated. The fact that income from the flight school didn’t begin to cover the cost of upkeep on the two county-owned airplanes is another reason the commissioners are taking a new approach to how the airport is managed in the future. “We’re going to minimize what the county spends,” said McLinko. The commissioners are hoping that an established company will step in to buy the planes – a Cessna and an Archer, both with about 250 hours of flight time on them – and the flight school. “I’ll be damned if I’m going to let the county give equipment for someone to run their own business,” McLinko said of the previous arrangement. He said that the county was ill-advised in the purchase of the planes and the validity of the insurance policy. In the meantime, the last two meetings of the airport board have been canceled, which McLinko attributed to some “bad blood” that he hopes can soon be worked out. Student pilot Chris Weakland, who brought up the matter for discussion at a public meeting the commissioners held on Oct. 25, was frustrated by the news as his ambitions were cut short by the decisions. His last flight was on Aug. 21. “It’s not like riding a bicycle where you can start where you left off,” Weakland offered, noting that the FAA (Federal Aviation Administration) will likely make him back up and repeat some of his flight time at his own expense if too much time lapses. His options at present are to wait to see if the county gets a new flight school or drive to Williamsport or Scranton to complete his flight training at airports there. Weakland suggested to Endless Mountains Lifestyles via email that “there is much, much more to the story surrounding the airport and the closing of the flight school,” but he did not respond when asked to elaborate. Licensed pilots can still rent the county-owned airplanes, the commissioners noted.